Here in the Twin Cities metro area it's standard procedure to run a separate water line for un-softened cold water to the kitchen. I don't like it, and I think this trend ought to change. When I used to live in Minneapolis, this was a non-issue. Minneapolis has great water, and there is no need for a water softener at all. When I moved to Maple Grove, living without a water softener simply wasn't an option. The water up here is very hard and will leave deposits over everything and gunk up the faucets very quickly. A working water softener is important. Much to my annoyance, the cold water to my kitchen wasn't softened when I moved in. 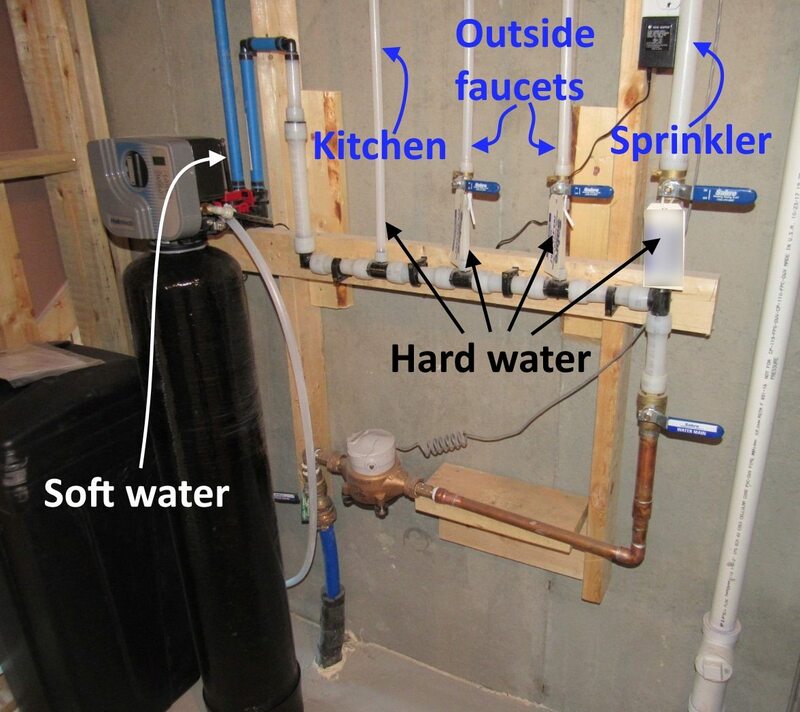 Visit just about any home built in the Twin Cities over the last thirty years, and about 80% of any other homes that have water softeners, and you'll find the same to be true. The cold water line to the kitchen bypasses the water softener on purpose. Plumbers actually go out of their way to do this. I've had plumbers outside of the metro area tell me that this is no longer being done, but this is almost all that I ever see on new construction homes here in the Twin Cities. This is still standard practice. I've asked a lot of plumbers about this, and they've all given me the same answer; it's an option. 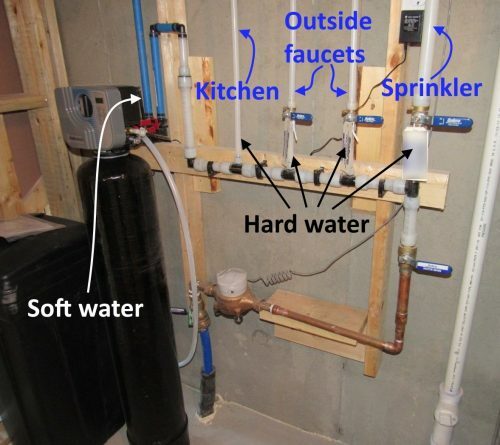 Some people like the option of having hard water available, both for consumption and for watering plants. I guess you're not supposed to water your plants with soft water. As for consumption, the idea is that we already get too much sodium in our diet, and we shouldn't be getting even more from our water. How much sodium is added to softened water? According to Pure Water Products, LLC, the amount of sodium added by a water softener depends on how hard the water was to start with. Here in Maple Grove, the water hardness ranges from 22 grains per gallon (gpg) to 25 gpg. To make it really simple, they say to multiply the grains of hardness by 1.89, and you have the total mg of sodium that is added to water through the softening process in one 8 oz glass of water. In other words, an 8 oz glass of softened Maple Grove water would have 25 x 1.89 mg of sodium, or about 50 mg.
To put that into perspective, a single slice of Brownberry® whole grain Outnut bread contains 150 mg of sodium. It's not nothing, and if you drink 50 glasses of water a day (or whatever number the experts are recommending these days), that can add up to a lot of sodium. Maybe. Despite the added sodium intake, I prefer soft water to the kitchen. Just a few months after moving to Maple Grove, my coffee maker bit the dust. All of those hard water deposits gunked it up and ruined it. A friend of mine had the same thing happen with an expensive espresso machine right after he moved from Minneapolis to Saint Louis Park. Not only that, but the cartridges in my kitchen faucet used to constantly get ruined from the hard water deposits, and I'd have to replace the guts of my kitchen faucet every one to two years. I'd also constantly have hard water deposits build up around my faucet that I'd religiously clean every few months. It was very annoying. To me, the downsides of hard water outweigh the downsides of soft water. Be warned, however, there is a difference in taste. I prefer the taste of softened water, but my son can't stand it. To each their own. If you have a water softener and you want to know whether or not the cold water running to the kitchen is softened, you have a few options. First, look at the base of your faucet. If it's full of hard water deposits, the answer is yes. You have hard water coming into your kitchen. You're welcome. If you want a more technical method, you could buy some water hardness test strips. You'll find a major difference in hardness between the hot and cold water at the kitchen sink if the cold is hard. Finally, you could just go down to your basement and take a look at the water lines. If you have a 1/2" water line with no shutoff valve tapped off of the water line before the softener, you're surely looking at a hard water line running to the kitchen. If you want to change this, it's pretty simple. Just re-route the water line to the kitchen from the hard side to the cold side of the water softener. If you're not comfortable doing that kind of work, hire a plumber. In most cases, this will be a quick and easy job, and you'll be glad you did it. I re-routed my own water line to supply softened water to the kitchen sink about a year ago and now I'm happy. All the time. If you want the benefits of soft water but you don't want the added sodium intake, install a reverse osmosis system, which will remove the added sodium. A filter won't.